1 Create a contact list Include everyone you know, friends, work colleagues, industry associates etc. Use LinkedIn groups to connect with people who may be in a position to hire you. 2 Target Target companies, industries then prioritise. Contact people who can help you reach the people you want to connect with. Set up Google alerts for companies you are interested in. Contact fellow LinkedIn group members. 3 Get systemised Get organised. Keep details of all calls, emails, contact, who referred who, what was discussed etc. www.jibberjobber.com is a helpful site. 4 Get a business card Keep the card simple. This allows you to give cards to people you meet. 5 Set objectives Set targets and measure your progress in terms of the number of calls, meetings and interviews you have.Segment meetings into informational meetings, or job potential meetings. 6 Write scripts for making calls or emails to potential networking contacts Write scripts if you are nervous or if it helps focus the conversation. 7 Plan Plan when to call, start at 8am. 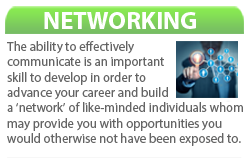 Be prepared to try numerous times to get in touch with the people you want to speak to. Often Managers are in meetings or out of the office, so don’t get put off if when you try they are unavailable. 8 Follow up Send thank you notes or emails to people who have helped you. Remember you are setting out to develop relationships. Someone may not have an opportunity for you when you first speak, but by following up they will be reminded of you again. Follow up can take many guises such as; emailing to update the person you met on any action you took from the information obtained during your meeting with them, industry news you have found, articles of interest to them, referring people to them etc. 9 Connect Connect on LinkedIn, as people will then see any posts you make. This will help to keep you at the forefront of their mind.